Oh this book was fun and different and fast-paced and amusing. I liked it a lot! 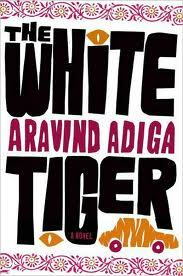 I've been to India, so that added a nice layer of familiarity (so I’ve spent time with Bangalore’s entrepreneurs, and also stayed with a family who had a driver in Delhi), but I think anyone would enjoy The White Tiger by Aravind Adiga. The narrator, Balram, is a self-made entrepreneur whose life serves as an example of the “new” India. He was born in a village (“the Darkness”) and then moves up to become a driver for a wealthy man whom he eventually murders (! that is stated at the beginning, so I’m not really giving anything away here), before starting his own business. The novel is written as a letter to a visiting Chinese premier, telling him how India really is before he visits, which is a bit of an odd choice but somehow works. The book shows the contrast between the wealthy and poor and the rising/struggling middle class that characterizes India today. Corruption, class warfare, and national identity are all prevalent themes (this would be a great book club discussion book). Stylistically it’s similar to The Brief Wondrous Life of Oscar Wao – quick-talking and clever and accessible. Adiga is TIME Magazine’s Asia correspondent and clearly knows his stuff when it comes to India and China and the underside of these rapidly growing countries. Through Balram he exposes the true conditions of glamorous New Delhi’s exploited servants (we drove through shiny high-rise Guargon on our way to Jaipur and heard all about the fabulous malls that you just drive into and never have to leave), and the degree of instituted corruption and bribery. The White Tiger is Adiga’s debut novel. This blog has pictures of the settings mentioned in the book. And an interesting interview with Adiga about his choices in writing the book and his responses to criticisms.